Just when we got done asking why on earth Amanda Bynes would toss a “vase” from her window, TMZ sent a producer out there to have a look! As we’ve reported, Amanda tossed out the glass item from her 36th floor window after a police officer noticed the reported bong sitting in plain sight on her kitchen counter. She snatched it up and tossed that sucker right out of the window, not giving a care for those possibly underneath her. The cops then busted her for marijuana possession, reckless endangerment and evidence tampering. Amanda made the claim that she didn’t have a bong and that it was a vase that she threw out of the window. 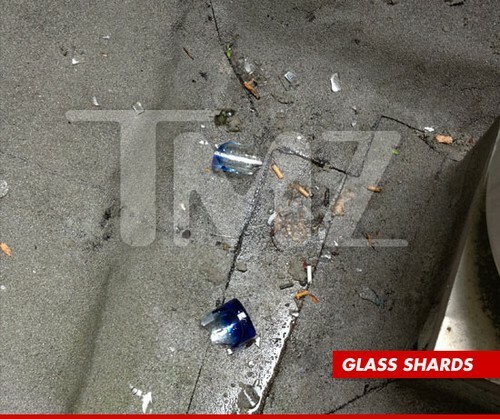 Since, TMZ dispatched one of their people to take pictures of the smashed glass residue. To say that it was a bong, in all seriousness, we would have to see the stem which holds the marijuana. Also, one would think that the authorities could run tests on the residue that’s been left inside of the “vase” to see if it’s actually drug paraphernalia or not. Is Amanda full of it or what? Do you think it’s a bong or not? Hit the comments and let us know your thoughts! Mila Kunis Snubs 12-Year-Old Fan – What A Meanie!